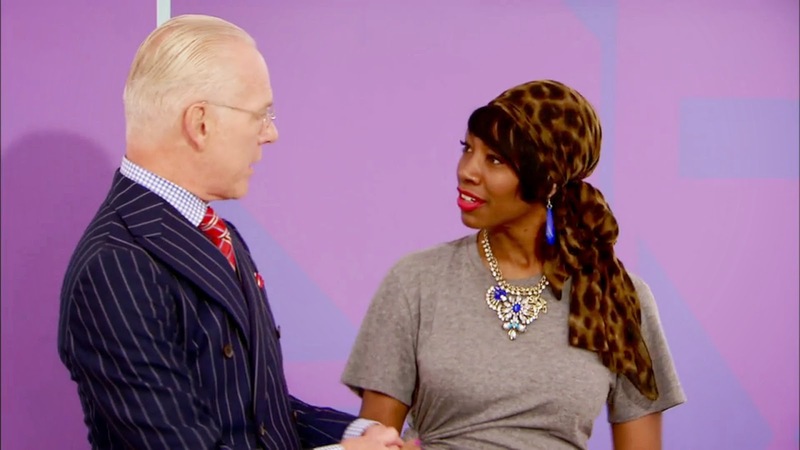 Dapper and Euro Chic: Tim Gunn and Chopard Co-President Caroline Scheufele--Episode 7 Season 13 "Project Runway"
This past week's Season 13 "Project Runway" episode on Lifetime dealt with Diamonds and Evening Wear...it was the "Chopard Challenge". 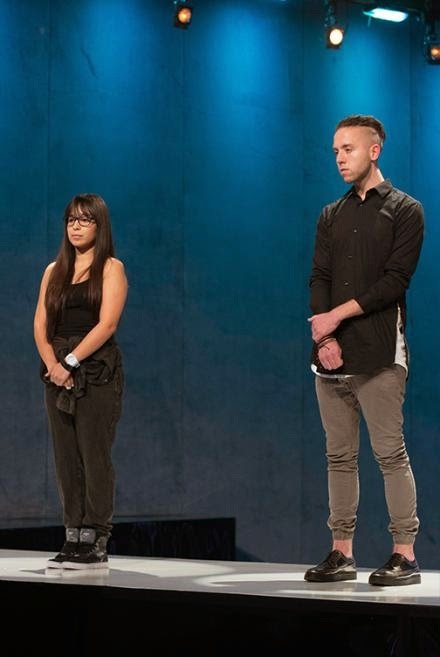 The show's Mentor Tim Gunn introduced the challenge along with Co-President and Artistic Director of the Geneva Switzerland-based jewelry manufacturer, Caroline Scheufele. 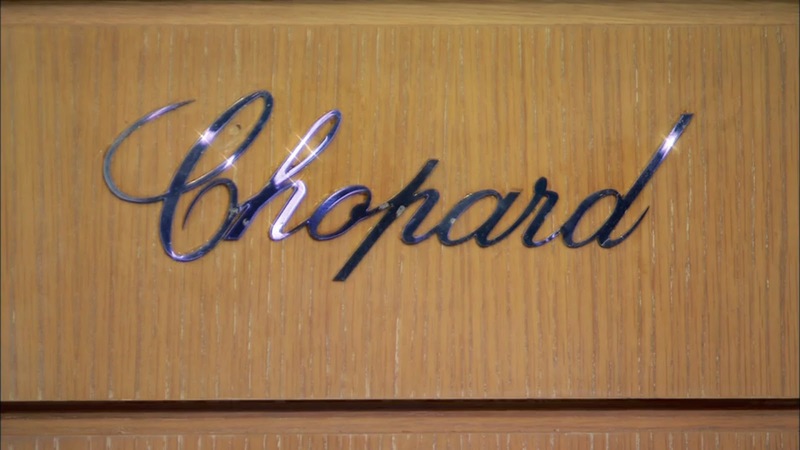 Get Security: Chopard jewels displayed on the formally-known-as-Parson runway stage--Episode 7 Season 13 "Project Runway"
Caroline along and her brother run the high-end jewelry company. They are German and yes, therefore the reason Miss Heidi Klum pronounced her last name so well when she reintroduced her during the Runway Judging. 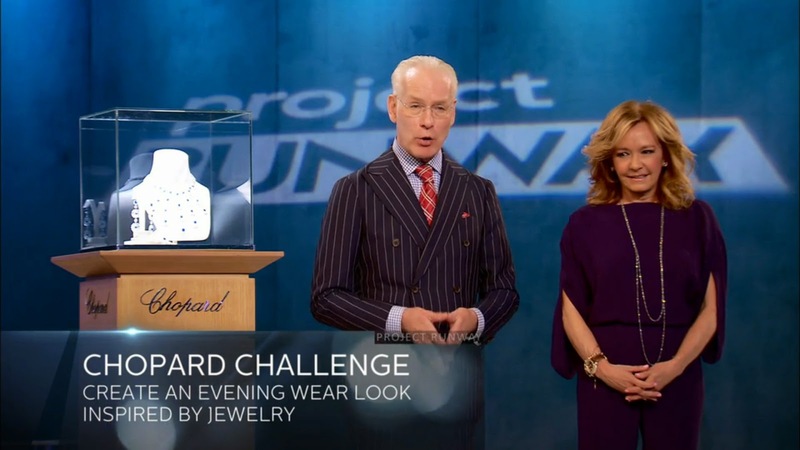 Not sure why such a Haute jewelry brand would pay to be part of a "Project Runway" challenge since well, the show's viewers aren't really the Chopard "market", but oh well....In case you're keeping score this is the THIRD Evening Wear Challenge in only 7 episodes of the show's season. Even I--who LOVE Evening Wear--think it might be A LOT. Why Did You Take Me Away From My Sequestered Suite at the Best Western? 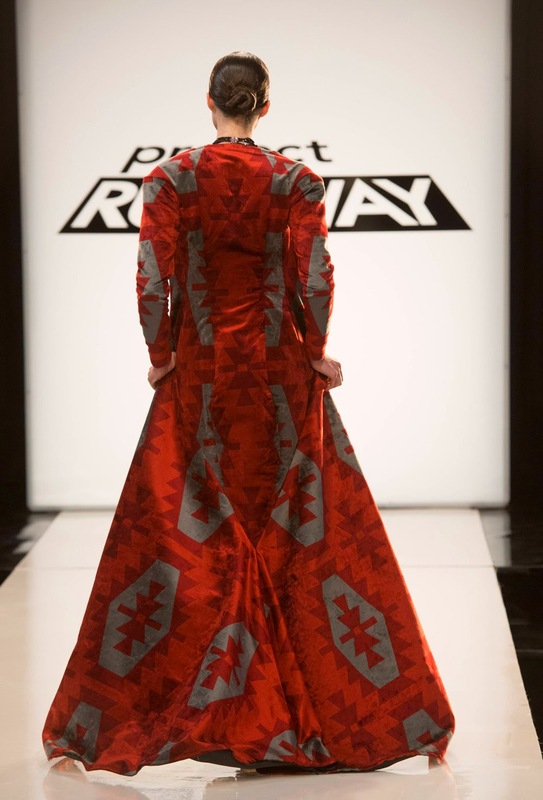 Designer Char Glover returns to the competition--Episode 7 Season 13 "Project Runway"
Guess Who's Back? Yes, kids, as we all guessed form last week's preview Tim used his all-important "Tim Save" and brought back last week's eliminated designer/contestant, Char Glover. 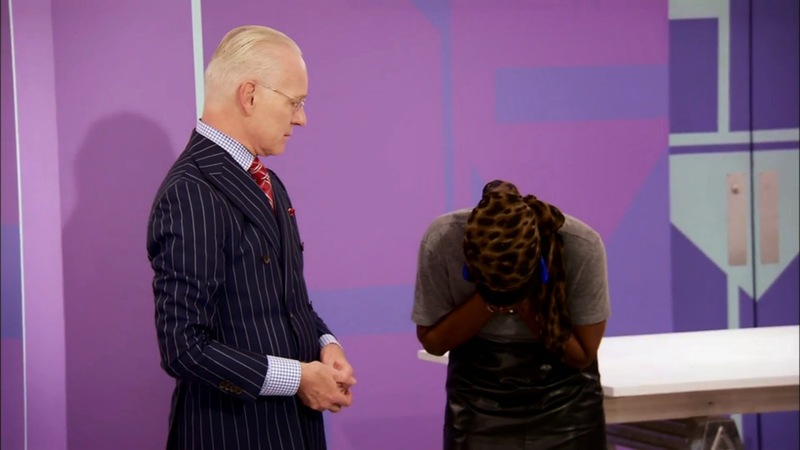 You can read my Lifetime "Project Runway" blog Recap to find out what I thought of Char returning and Tim using his "Tim Save". 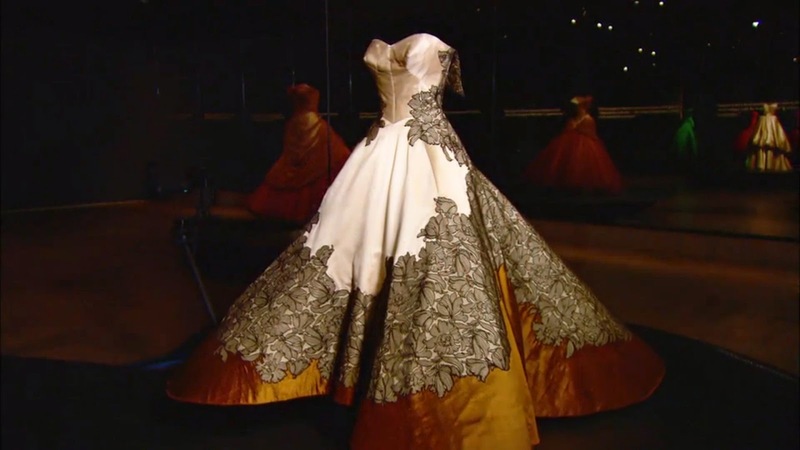 Gown Fabulous: This past Summer, I had the chance to visit this exhibition and it was BEYOND!!!! It closed last month so if you did not go...Ooops! 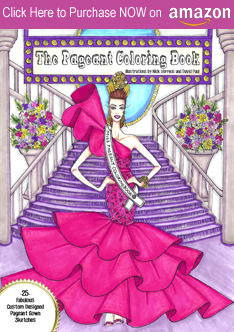 But you can always go online and buy the accompanying book HERE. Broken Foot Nina: Judge Nina Gracia broke her foot over the Summer--when they filmed the show--and so she showed her new "accessory" during the judging--Episode 7 Season 13 "Project Runway"
Amanda Valentine: For some reason the judges--save for Zac Posen--were gushing over this look from designer/contestant Amanda Valentine. I. Did. Not. Get. It. Nothing Luxe and nothing chic about a transparent raincoat and stretch bodysuit. 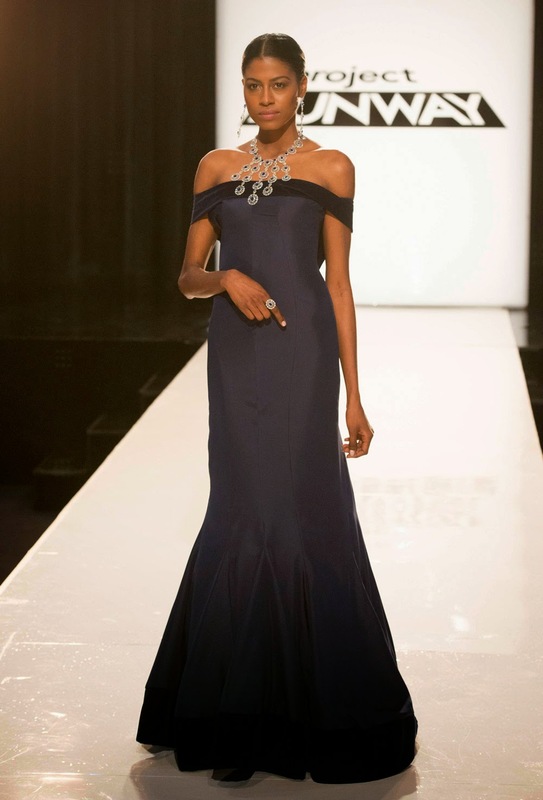 Sean Kelly: New Zealand-born/Brooklyn hipster Sean really made a stunner of a gown; it showcased the Chopard jewels in such a beautiful manner...his model looked like a royal. Korina Emmerich: "Meany McMeany" Korina was the Winner for this stunning coat and gown look. 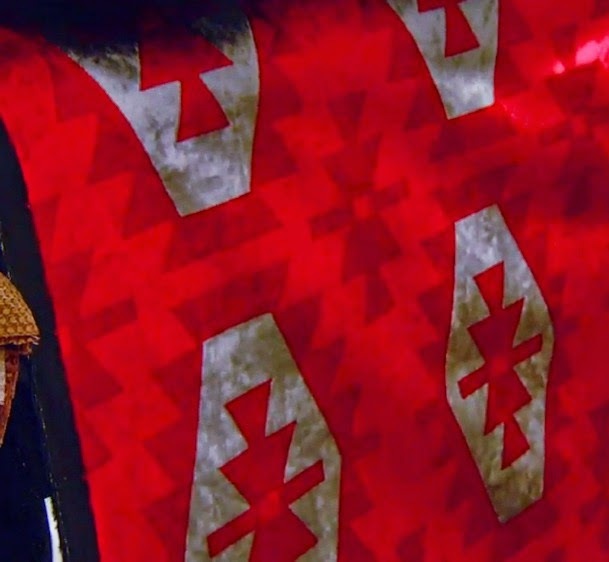 At first, she almost screwed it all up by putting seams into the front of the coat, breaking up this wonderful Southwest print. 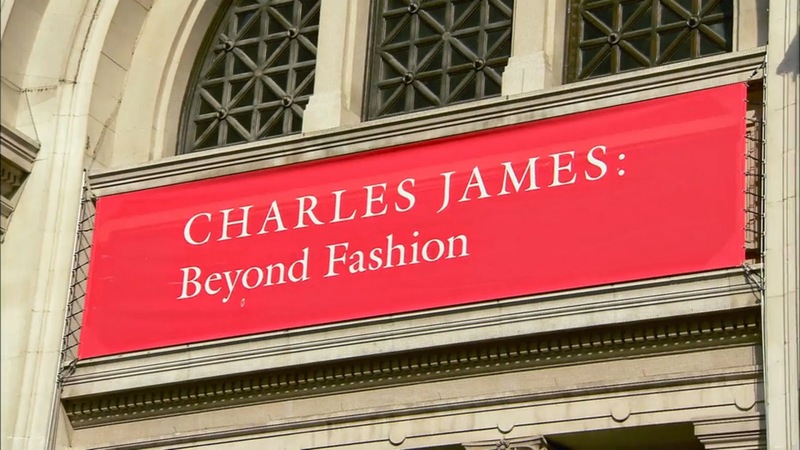 But with Tim Gunn's advice, she decided not to that and instead, was able to not disrupt the bold print. It was EVERYTHING! Kini Zamora: Kini, for some reason, was having construction issues which is (if you've watched the season) not normal. He created this creme chiffon and neoprene look and really struggled with the bustier. As you can see from the photo above, it wasn't cute. Alexander Knox: 22 year-old Alexander was at the bottom for this scrunched iridescent taffeta (I don't want to write those three words EVER again!). It could have been a Vivienne Westwood-like moment but alas, he wasn't up to the task; there were pins all over the place and the gown look tortured. 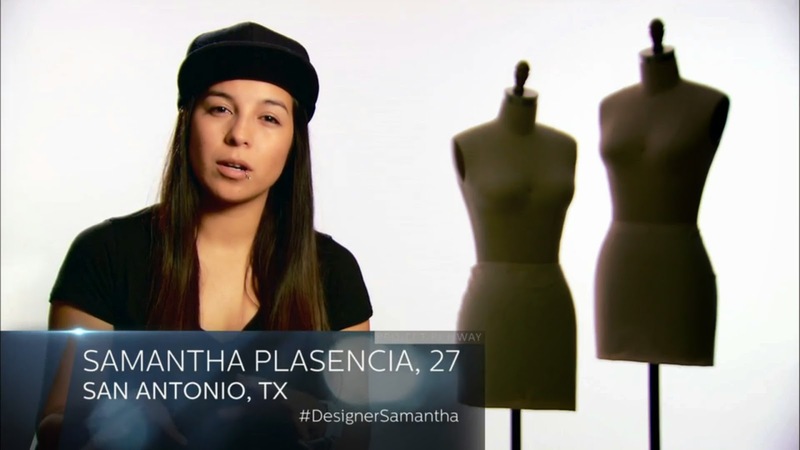 Samantha Plasencia: San Antonio Texas-based designer Samantha Plasencia kept going on and on during the episode about how she WAS NOT an evening wear designer...and yep--it showed. Her look was a basic, nothing special strapless dress that was Prom-a-Licious Bland. I'll do a BLOG about the NY Fashion Week Finale Collections next so...Stay Tuned! When last week’s episode ended, there was a preview of what was to come. I guessed two things (along with most of America): Char was going to come back and there was going to be a THIRD evening wear challenge. I was right on both counts. 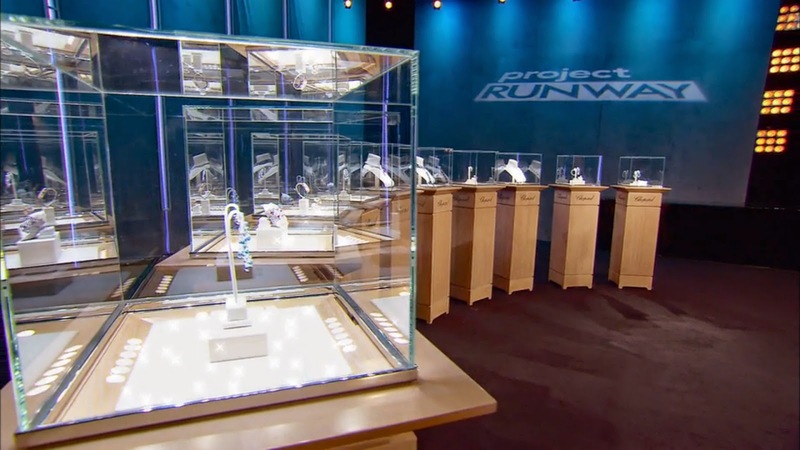 As this week's episode begins, the runway is packed with display cases featuring millions of dollars of jewels. Tim announces, along with Chopard’s Co-President and Artistic Director Caroline Scheufele, that this is the Chopard challenge: to create an extravagant evening look inspired by the jewelry. 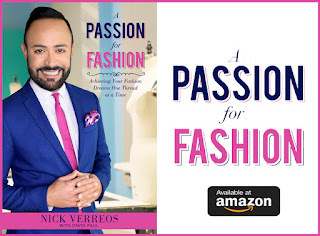 When Tim finished his introduction of the challenge, I scratched my head thinking, “Another evening wear challenge?” Nobody loves formalwear more than me, but even I think focusing three challenges out of seven on evening wear is a lot. I also don't really understand why a luxury brand like Chopard would pay to brand itself within one of the show’s challenges. The Lifetime and “Project Runway” viewing market is not the Chopard market. It’s not a cut-down, it’s just true; I venture to guess that 99.8% of the viewers (including yours truly) cannot afford a $2 million Chopard diamond necklace or a $200,000 diamond watch. If this was “Project Runway Monaco” or “Project Runway St. Tropez," then I’d understand. Time for Char! Soon after the challenge is given to the designers, we see Tim Gunn looking distraught as he says in voiceover that “Something is weighing heavily...and it’s kept me up all night." He walks back into the workroom, holding back tears, while bringing in last week’s auf'ed designer, Char. Tim subsequently announces that he has decided to use his Tim Gunn Save on her. While everyone is happy to see Char back, Kini acknowledges what I’m thinking: No More Saves, Y’all! Click HERE to continue reading my RECAP! 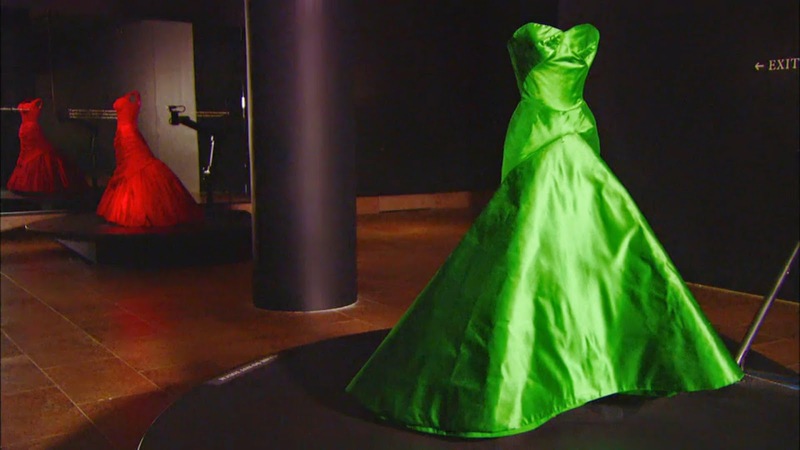 0 Response to "PROJECT RUNWAY.....Season 13 Project Runway Episode 7 Recap: Shine Bright Like A Diamond"